Protection from curbs, speed bumps and steep approach angles of driveways is imperative to keeping your 2016-2017 Camaro SS front bumper in pristine condition. Scrape Armor is the only system available that not only protects from future damage but also covers up existing damage. Installation is easy and non invasive. Install Scrape Armor and start protecting your investment today. Great Part, Easy installation, Glad I bought this part. PROTECT AGAINST FRONT END CLEARANCE HAZARDS. Today's automakers are designing cars with extremely aggressive approach angles and low hanging front front bumpers. It looks great but as a result most cars are taking a beating...literally. Abrasion damage isn't just a problem for ground hugging supercars...its an issue for almost every sedan, coupe and sports car sold today. You've likely experienced this yourself and seen the damage it does. In the event this damage has already been done, Scrape Armor protection kits can cover it and prevent further damage. Scrape Armor's innovative digital design process ensures every part produced will protect your vehicle where it needs it most. TEKLITE POLYMER - Every Scrape Armor protection panel is manufactured from Teklite Polymer ensuring the highest level of protection and the lowest amount of friction. GLIDETEK RAILS - Scrape Armor's exclusive Glidetek Rail technology reduces the contact surface area of our protection panels by more than 50%...less surface area = less friction = maximum protection. ELIPTEK PROFILE - The digitally engineered Eliptek Edge Profile greatly decreases the potential for your bumper to become hung-up on a parking curb or other obstacle, whether you're moving forward or backing up. EXACT FIT - Scrape Armor protection panels are digitally templated for precision alignment with your vehicle's existing panels and fasteners. FASTENERS - All Scrape Armor protection panels make use of existing fasteners whenever possible. If the application calls for supplementary hardware, we provide the finest OE Grade Stainless Steel Fasteners available-specifically designed for the material vehicle bumpers are made of. 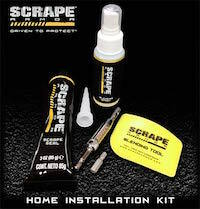 We've left nothing out...Scrape Armor's proprietary installation kits result in a perfect fit every time.